It seems like a heavy task eh? When you think about your online store, your mind is probably fostering a tornado of “Don’t-Forgets” – payment options, product pictures and descriptions, website design – are you nauseous yet? Believe it or not, it doesn’t have to be this way. Building your online store can be easy and relatively stress free because we’ve thought of all the little details so you don’t have to. Previously, building your own online store meant you needed to set up payment gateways, shopping cart scripts, SSL certificates, and a lot of other things that will make your head spin. With our Store Manager, everything comes in a neat little package – all you have to do is customize. Obviously, the main purpose of your online store is to sell products and generate an income. Now, we can’t tell you what to sell or how to price your products, but we can help you get the ball rolling because the faster you set up your online store, the sooner you can start making money. This is where you get to parade around your products and you have an arsenal of tools at your disposal. Our Store Manager gives you options for your products that make management easier. 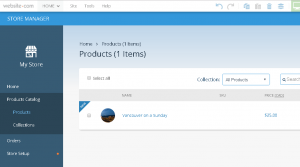 You can create a product as part of a larger collection, put an item on sale, or hide the item if it’s out of stock – all with just a few clicks. These are the kinds of details you actually want to think about. When your inventory gets so big that it’s hard to keep up, use the internal notes box with each product to stay organized and leave reminders for yourself that aren’t visible to the public. Don’t forget to input your store information which is what your customers will see on their invoices. You can also upload a customized store logo as a finishing touch. Did we mention that you can even write your own Terms and Conditions and Refund Policy? (we’re really trying to help you make an online store as painless as possible). The next thing is to figure out is shipping and payment options. The shipping company is entirely up to you, so make sure you do a bit of research before you set it up. Once you’ve decided on which company, you can work that cost into your store’s shipping methods. Depending on what your shipping parameters are, the delivery time and taxes will vary. The Store Manager has rules that you can customize under the Shipping & Tax option that will build the shipping time and cost into each product. This next part might be the main source of your headache: How to set up payment options. Setting up online payment options can be complicated because there are setup and transaction fees which credit card companies apply every time a customer makes a purchase using their method. We know you don’t need this kind of headache when you’re already focusing on getting your business off the ground, so we’ve taken care of the grunt work: With our Store Manager, you don’t need to act as a middle-man between your customer’s orders and transaction fees because we’ve worked PayPal and Stripe into your website. All you need to do is set up your method of payment and watch the money accumulate. Both PayPal and Stripe are widely accepted, and Secure forms of payment which your customers can link to their debit accounts or credit cards. Stripe is a relatively new online payment option that works in the same way as PayPal but it also allows customers to use Bitcoins as a form of payment. The setup of your products is what most people call the hard part. You can now rejoice because you’ve completed the core of what it takes to have an online store – you’ve got a product that can be sold, and a way to process payment and deliver the product to customers. But how do you organize all these elements on your store? Trick question – you don’t! The Store Manager takes everything you’ve uploaded and updated, and it creates your store for you, matching the template you picked out for your website. You can customize your store’s page by selecting “Store Home” in your list of pages. If you ever want to see what your Online Store looks like – just click “save” and preview the page. Continually checking your published view and making changes will guarantee a better experience for your customers and also help you figure out what works and what doesn’t. Test, test, test – this is key. All the excitement from having an online business shouldn’t be clouded by the work that needs to go into building it. It will take some work, but we’re here to make the process as smooth as possible. We worked all the details we could into the Store Manager to give you the best and easiest experience, but remember to keep testing. This is the only way you’ll know what works and what doesn’t. The good news is that if something doesn’t work, you can change it up in the Store Manager with just a few simple clicks.